Home » Economic Predictions » The Epocalypse: What Will D-Day Look Like? D-day, December 16, 2015. It’s now the dawn of that day when either the Fed Does or the Fed Doesn’t. It doesn’t matter. Either way, the economic apocalypse begins. Let me share something counter-intuitive. Whether the Fed raises interest rates or not, this Wednesday is D-day for the Fed’s economic recovery because the Fed is Damned if it does and Damned if it doesn’t. I’ll certainly show you why, but the counterintuitive part is that you can expect the market to crash upward as it leaves Wonderland and returns to reality. What if the Fed doesn’t? While I am certain, like many, that the Fed will raise rates, the US stock market may crash faster if the Fed does not. That’s one thing that is counter-intuitive to some. I believe it would drop the very next day out of shear bewilderment as people try to fathom what the Fed’s failure to raise rates means. Throughout 2015, the Fed has been building up expectations for its first raise in interest rates in nine years. In a world where every word of the Fed is dusted off with a soft-hair brush like an artifact in the sand, the Fed’s broad hints of an interest-rate rise are about as abrupt as the Fed gets. If the Fed doesn’t do it on Wednesday, then it doesn’t happen in 2015. If the Fed fails for the last possible time this year to raise rates after setting up expectations all year long and heightening those expectations in the last couple of weeks, people will be exasperated that this word play never ends. Everyone who still believes in the Fed will wonder what went so wrong that the Fed still could not raise rates. Questions will abound: Does the Fed not believe in its own recovery? Will we suffer the uncertainty of “will they/won’t they” like a repeating, nauseating dream forever? Does the Fed have no end game? Have they really painted themselves into a corner? Are the permabears right that we’re living in an illusion? If the Fed cannot do it right now when investors are most expecting it and unemployment is where the Fed says it wants things, then whenever can it? The Fed will lose all credibility, and in the fiat money game, credibility is the core value of money. What if the Fed does? Maybe I am a contrarian to contrarians because while I have taken the contrarian view that the recovery is an illusion, most contrarians appear to believe the stock market will crash as soon as the Fed raises rates. I take a counterintuitive view as being most likely. The market will most likely soar, even though raising rates definitely will cause its demise. How is that possible? Fear of the Fed’s first rate increase is already priced in as the expectation for Wednesday’s Fed meeting. If the Fed raises rates, I would expect a momentary pause — a gasp of uncertainty — as investors quickly look around to see if the sky falls. Then when it doesn’t fall, they will breath a huge sigh of relief and take that as proof that the contrarian or bears were wrong. In sudden euphoric lightness of being they’ll proclaim, “We’re all right! We made it! We survived the day we have been told fear, and the sky didn’t fall.” Worry will give way easily to euphoria, which wants to happen. The feeling of nothing can stop us now will take the day. The Fed’s plan worked; things didn’t fall apart as the prophets of doom and gloom said. We are well on our way! But what do you know about euphoria and human beings? In my experience, euphoria is more often divorced from reality than based upon it. It skews perception of reality, and usually comes in a manic-depressive wave. First you are washed over by the crest of euphoria and then you are sucked down into the trough of despair. Euphoria, in other words, never has staying power, and when you come out of it, you typically sink into depression if for no other reason than that it went away. So, here is the thing: Whatever the Fed does do or doesn’t do, doesn’t change the reality that we are already surrounded by a global recession. Global GDP has been dropping every quarter of the year in 2015. Here is reality: You are riding along in a vibrantly striped, hot-air balloon. That balloon is the stock market, and the hot air that has been keeping it aloft all year is generated by the Fed’s stimulus — the fire fueled by free money. 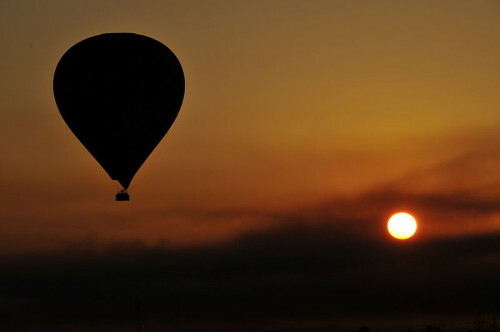 All year the balloon your riding in has bounced along below the clouds. You’ve wanted to get above them. You get a little fire under the balloon, and it lofts upward briefly to just touch the clouds … only to fall again. At the very end of this futile run, the fuel runs out. You’re afraid you are going to crash, but your hot-air balloon hits a thermocline just as the fire goes out and soars aloft like you’ve never felt before. You feel euphoric. But does that save you? There is no more hot air inflating the balloon; so your balloon is deflating, and the climate all around you has turned quite turbulent. Your momentary euphoria only makes your dread deeper when reality kicks in as the thermocline goes away. If the last of the Fed’s free fuel goes away on December 16, what’s going to float your balloon? China isn’t going to start buy our products in greater number when its own economic cooling is deliberate, and it’s competing against our products with a strong dollar and weak yuan working against us. The high-yield bond market is crashing horrifically, which is usually followed by a stock-market crash. The Fed’s rising interest certainly isn’t going to help that situation. That year-long ceiling on the stock market doesn’t go away because the Fed stops its stimulus, and your ride along that ceiling was largely supported by corporate stock buy-backs, which were supported by the Fed’s low interest, now going away. The big Apple, one of ten stocks that kept the stock market’s average level, is falling because of diminished iPhone expectations right when the market cannot afford to lose any buoyancy. Commodity prices are sinking all around you and will stay down for the long term, catching many US companies in a fierce downdraft that leads to new unemployment. The declining growth of corporate revenue doesn’t reverse just because Fed stimulus ended. That ought to be obvious. So, with no free fuel from the Fed, what’s your fuel? Where does the new money come from? Retail doesn’t start doing better just because the Fed turns up its interest targets, causing a rise in credit-card interest. ISIS isn’t going away and has started reaching outside of the Middle East. Inventory backlogs don’t go away because the Fed raises interest. The national debt remains four times higher than it was before Obama took office, and the nation is still piling it on faster than it ever did before the Great Recession. So, how’s that going to turn around when the cost of financing the debt gets worse? The greater part of this earth is buried in dollar-denominated debt that only gets worse if interest rates increase, heaping extra weight on the rest of the burdened world. Global recession doesn’t end because the Fed ends its stimulus. Forty-plus stock markets now in steep decline, several of them crashing, aren’t going to magically reverse because of this day. The European Central Bank took interest rates sub zero and then took them into the deep, sub-zero range, and European stock markets rewarded the central bank by falling because addicts need bigger hits to get the same high. The economy doesn’t crash because the Fed ends its free interest. The economy is already sinking. What crashes is the illusion of recovery. December 16, 2015, is D-day because it’s the day when reality starts to sink in. It’s the day when we either all see together that the Fed is incapable of taking us off artificial life support and realize that means we’re dead without it or when the Fed does take us off artificial life support, even though our vital signs are already receding as indicated in the list above. Simply put, the end of the charade is here whether the Fed decisively starts raising rates or states that once more it is not going to raise them. Why does the pseudo-recovery have to end at this inflection point? As soon as the stock market dropped in August, even though I had predicted it would fall in the final quarter of the year or maybe earlier, I said to expect a good bounce, and bounce it did … real high. I said to expect it to fall right back down, and fall it did, right back down to where the S&P 500 is now down 2% from its starting point this year I explained that’s how these things go: The bull doesn’t give up trying, but the forces pulling it down are great enough to prevail. So, don’t pay too much attention to its death spasms. Dead people still kick … for a short time. I can’t predict how the market will react if the Fed raises rates, because that initial response is just a matter of feelings. However, the basis for predicting the market’s ultimate demise due to the rate increase is simple. If the market is doing this poorly for an entire year with an endless supply of free money for banks to loan out at almost no interest, how is it possibly going to rise when its only remaining source of fuel is turned off? It may bounce in euphoria over the simple relief that it didn’t immediately crash when the fuel tap was shut off, but that death spasm can’t last long with nothing left to lift prices up. The first interest-rate increase in nearly a decade cannot possibly help a slowing economy. And, if the Fed does the opposite and keep rates at zero, the inability to raise interest after telegraphing intentions to do so for an entire year should pretty well convince investors that the Fed has no end game. Market reaction is likely to be much harsher toward another postponement by the Fed than it was on the day after September’s aborted interest increase. Here’s the bottom line: When the low interest ends, the companies that have been borrowing money to buy back stocks do less of that. The investment banks that could borrow money for free to purchase stocks … can’t do that any more either. The purchase of stocks overall slows in a market that has only kept level through the year by ten companies, one of which is receding at the moment. The last source of new money into the market ends. Money may move from bonds into stocks for awhile longer perhaps, especially if we enter that period of short-lived euphoria, but that only means the high-yield bond market crashes quicker, taking down the economy with it and ultimately hurting the stock market, too. The Fed has to raise rates; but, if it does so, it will be very reluctant to get back into this game again and have to go through another period of trying to get out of it again. So, it ends the last flame that floated this balloon market.